I have observed that pro-vaxxers (not doctors, pharmacists, scientists, etc, but their religious adherents and believers) behave in a similar manner as collectivists. This is what Nietzsche termed "herd morality", which is the morality of the weak and the envious; they gather together in groups, and in their envy attack competent/strong individuals with their perceived collective strength. It's essentially the mob mentality, also known as the crucifixion of reason. I find it ironic that the pro-vaccination collective terms the necessity for as many people as possible to receive vaccinations "herd immunity", as it appears to be the perfect real world representation of their herd like morality. 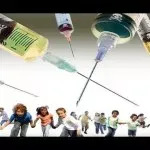 Herd immunity is the notion that vaccines are only effective when a certain percentage of individuals within a given population are immunized, and that an unvaccinated child is somehow a threat to a vaccinated child. This notion is obviously outlandish, and basically ignores the reasoning why the military vaccinates their troops prior to deployments to third world countries with low vaccination rates. Let's take a look at this from a religious and personal belief standpoint, pro-vaxxers perceive that they have a weak immune system, and that they need vaccines administered to them from their religious authorities to be strong. It's a religious system really, and doctors, scientists, and the holy papal CDC administer their holy rights through the act of vaccination. It's the vaccines given to them by science (god) that makes them strong, and not their own natural immune system, sanitation, lifestyle, thought patterns, et al. It's a religious movement where they admit their innate weakness through prostrating themselves to their religious authorities, gain favor with their god and their peers through their ritualistic observance of the holy right of vaccination, and zealously proselytize, shame, and attack those who might not feel the need to worship alongside of them. It's a really easy way for a weak individual to get a sense of moral superiority, meaning, and purpose, without actually having to do the self-reflection and inner work necessary to actually be superior, find meaning, and live a purpose filled life. It is extremely nihilistic, as their purpose comes from serving their religion, and their meaning comes from the approval they receive from their priests and peers; this is similar to how Nietzsche viewed Catholicism's ritual observance.